With MOONRISE KINGDOM, director Wes Anderson perfectly captures that beautiful, fantastic, and all too brief moment when childhood innocence gives way to the beginnings of sexual maturity. Anderson's twelve-year old star crossed lovers Sam (Jared Gilman) and Suzy (Kara Hayward) are just beginning to toy with the idea of physical intimacy, but are still childlike enough to find running away from home (or in Sam's case, going AWOL from his Khaki Scout troupe) to embark on a wilderness adventure just as exciting, if not moreso, than getting to second base. Sam is an orphan and extremely precocious, which is at least part of why his fellow scouts dislike him. Suzy is mature for her age as well, and apparently viewed by her lawyer parents Walt (Bill Murray) and Laura (Frances McDormand) as a “problem child”, or so Suzy infers from the title of a book she finds in the house. When the two adolescents met a year ago, they immediately sensed they were kindred spirits and set about planning their future escape together, said plans having just been put into motion as the film begins. 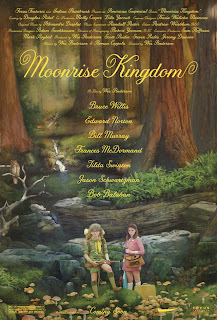 MOONRISE KINGDOM isn't quite a children's movie, but it definitely understands the way 12 year olds see the world. 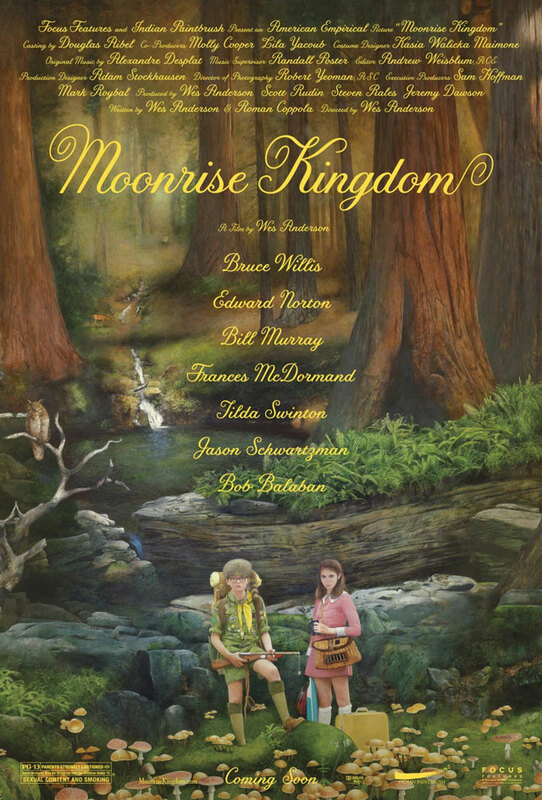 Like all of Anderson's movies, MOONRISE KINGDOM is a nostalgic, idealized comic fantasy. Certainly the film's look is familiar to anyone familiar with the director's past work, with sets and locations that call attention to themselves, a color palette composed of bold primary colors that seem to have become washed out like an old photograph, and frequent static shots that frame characters and objects like rough hew folk paintings. And of course there's the deadpan, off-kilter sense of humor and oddball characters (which in addition to the aforementioned stars include Edward Norton as Sam's Scout leader and Bruce Willis as a local police officer) that characterizes all of the auteur's work. There's also a little more genuine emotion this time around, though. That's not to say that this is necessarily a “better” film than RUSHMORE or THE ROYAL TENENBAUMS, or even the much maligned THE LIFE AQUATIC WITH STEVE ZISSOU, which this critic happens to like a great deal. It is, however, a slightly different approach that shows Anderson growing as a filmmaker while still holding on his trademark style and sensibilities. 3 1/2 out of 4 stars.